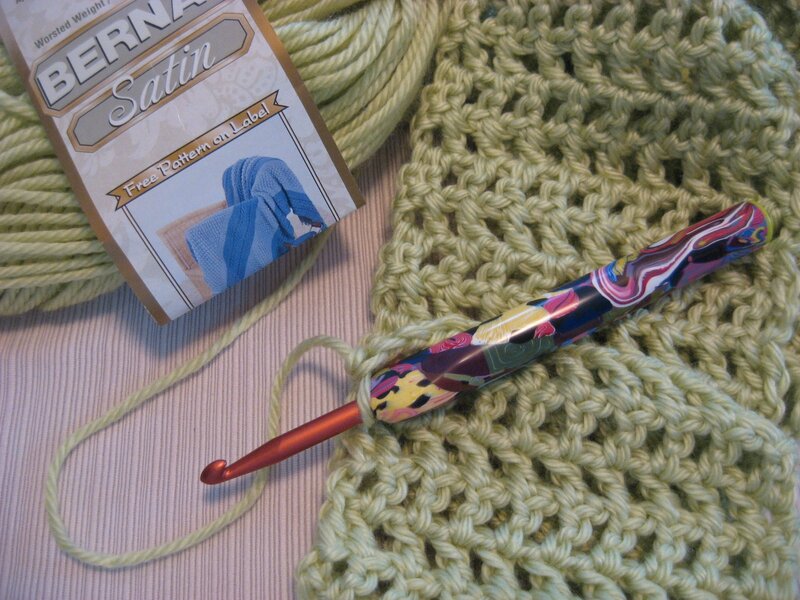 If you are a crocheter, you know how good it feels to sit down with a ball of yarn, your favorite crochet hook, a pattern or idea, and a little time. 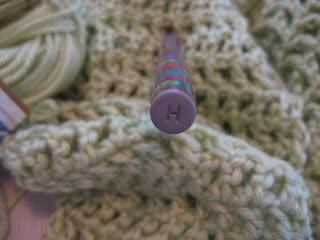 Up until last week, I had plenty of yarn, lots of favorite crochet hooks, too many patterns and ideas to count, but alas, very little time to enjoy it all. Those of you who are followers of Hooked On Needles know that I went back to college last fall and have put my blogging on hold during my school time so I can devote my full attention to my studies. So now that I am finished with school until the fall semester begins in September, my poor neglected blog will get some of my attention and I'll be able to share with you some of the projects I was able to sneak in between studying for lab exams, chapter quizzes, finals and all that other fun stuff that comes along with taking Anatomy and Microbiology in the same semester! And in case you are wondering, my GPA for the fall semester (4 courses) was 4.0 and for this semester (2 lab courses) was 3.94, so I guess sacrificing a little hookie time paid off in the end! Isn't that clever? It's a size H which is what I generally use for most of my crochet projects. 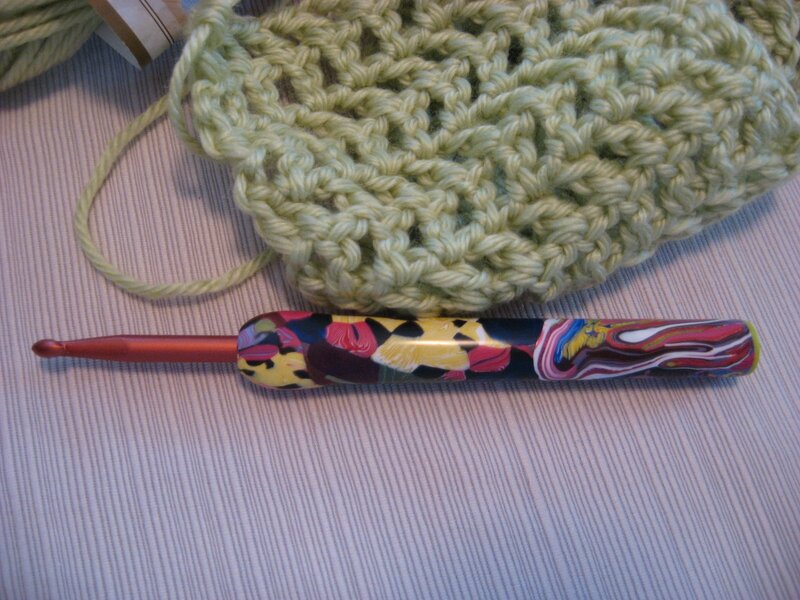 The polymer clay feels so good in my hands while I'm crocheting, and with the shaft of the crochet hook being just that much bigger, my hand doesn't tire as quickly. You didn't think I could stop at just one, did you? Of course not! 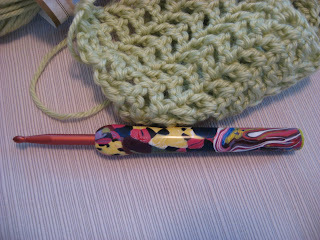 But I already owned several hooks in different sizes, so I asked Lisa if I could mail some hooks to her for covering. And that is just what I did. I mailed her a G hook and an I hook, and she used some really wacky mixed up clay that I had seen on her blog and liked to cover my hooks. I also asked her to make the handles just a bit thicker and to add the flattened thumb rest at the top, which she was kind enough to do for me. These hooks would be a wonderful help to anyone who has carpal tunnel syndrome or arthritis, or any condition that makes it hard to hold small items for very long. 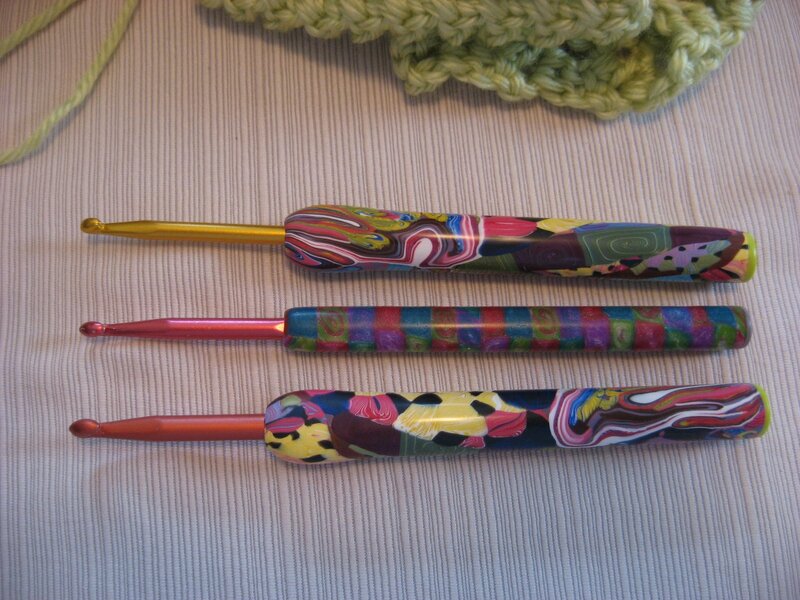 So now I have three custom covered crochet hooks that are easy to hold, feel good in my hand, and allow me to crochet my evenings away, now that I don't have to worry about studying for a while! Congratulations on your courses. I have been thinking about you. Enjoyed hearing the crochet hooks. Looking forward to hearing about what your have been doing! How wonderful to have a year complete and with such wonderful grades - way to go Mary Grace. I am sure your family is so proud of you. I hope you have a relaxing summer with lots of crochet time! 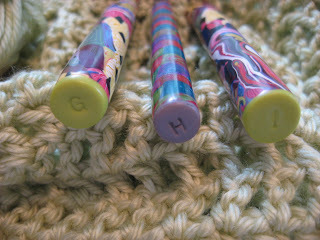 Thank you so much for posting such a lovely review of my hooks! I am so glad you like them. And Great Job on the GPA!